An anesthesiologist assistant works extremely closely with a licensed anesthesiologist to administer anesthesia to patients undergoing surgery. The assistant will often prep patients before they undergo anesthesia and will take care of the patients afterwards. The assistant will work closely with other hospital staff such as nurses and they may need to work long hours depending on the medical institution they work for. However, they are very well compensated. Anesthesiology assistants fall into the broader group of physicians assistants, which is a rapidly growing field that is high in demand. Assistants do need a college degree and they need to pass certain licensing requirements. According to the Nova Southeastern University, an assistant will also need a certain amount of hours within the operating room to graduate. An anesthesiology assistant needs to be extremely conscientious and able to discuss complex procedures with patients. The anesthesiologist assistant is a part of what is called the “Anesthesia Care Team.” The licensed physician in charge of the team will direct the assistant as is necessary to care for the patient. The assistant will begin by questioning the patient and referencing their past health history. A physical examination will be done by the assistant to detect any possible anomalies or issues. If the patient is ready to have the anesthesia administered, the assistant will place monitoring devices on the patient to report the patient’s condition throughout the procedure. Anesthesiology assistants fall into the broader group of physicians assistants, which is a rapidly growing field that is high in demand. The assistant will administer medications per the licensed physician’s direction and will continue to monitor the patient’s condition as the surgery progresses. The assistant is responsible for aiding in the event that the patient has an adverse reaction. Further, the assistant will usually help assist a little in the recovery of the patient as the anesthesia wears off. How Do You Become an Anesthesiologist Assistant? 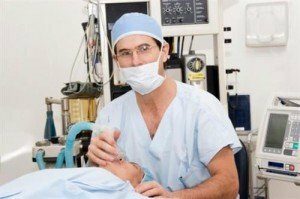 An anesthesiologist assistant is required to have a master’s degree. The program will need accreditation with the Commission on Accreditation of Allied Health Education. Similar to doctor’s, an assistant will usually be trained in a teaching hospital or given on-the-job training at a hospital that works directly with their school and their degree program. Many assistants will begin learning in a hospital environment through the final years of their education. Anesthesiologist assistants need to perform well if they are to actually enter the field. The field of anesthesiology is extremely critical to patient health and safety. How Do You Advance as an Anesthesiologist Assistant? Many anesthesiologist assistants continue their education and eventually receive a medical degree. Because a master’s degree is required to become an assistant, the transition into a medical degree program usually isn’t very extensive and a transition into an anesthesiology degree can only take a few years of extra training. About 10 percent of those that acquire a degree as an anesthesiologist assistant will go on to become medical doctors. Becoming and operating as an anesthesiologist assistant can be an excellent career path for those that want to become a medical doctor but do not have the resources to acquire a medical degree immediately. The degree is intended to serve as a premedical degree that offers upward mobility to students interested in moving forward with their medical career at a later date.